In the early part of this Century the writer, who between 2002 and 2018 was the keeper for the Manchester Anglers’ Association, wrote a series of essays for the parish newsletter on topics related to the river that flows through Horton. In those essays he made a few references to the old hatcheries that the Manchester Anglers used to maintain at Horton and these two monologues reveal a little more about them and how they came to be built and operated. When the MAA came to Horton in 1880 they found a village offering warm hospitality, a river rich in wildlife but one that was rather devoid of fish. It was surmised that the brown trout that were previously abundant here had been severely depleted by the actions of the navvies who built the Settle to Carlisle railway. A favourite past-time for the navvies on a Sunday was to walk the river with a sledge hammer and pocket of dynamite. The pools were treated to a stick of Dr Nobel’s linctus and large rocks struck with the hammer. Trout would rise to the surface, be collected and supplement an otherwise monotonous diet. There was little chance of brown trout recruiting quickly through natural breeding as the weirs and falls between Horton and Settle prevented (and still prevent) them from travelling up from lower reaches of the Ribble. 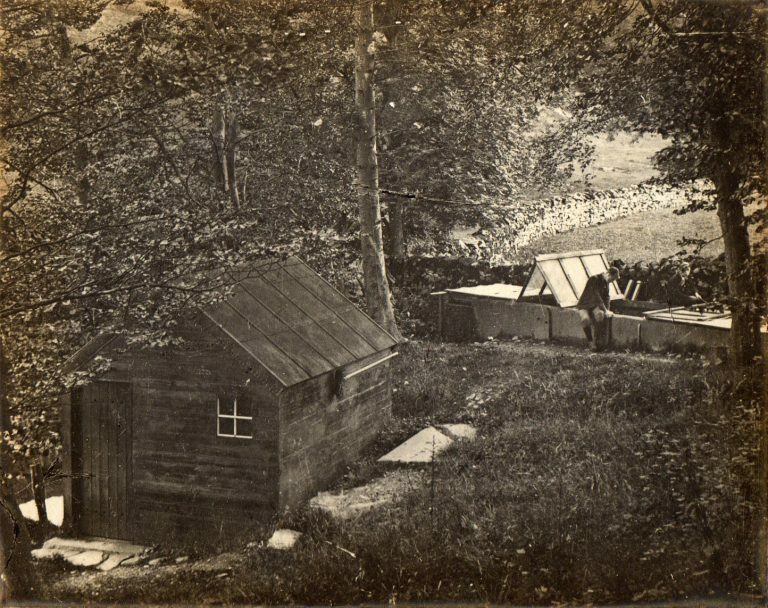 So in 1884 the first fish breeding house was set up in Douk Ghyll close by the Archery. A paper read before the Manchester Literary and Philosophical Society, by F. J. Faraday F.L.S., on February 8th 1887 was entitled “Notice of a fish-breeding house erected by the Manchester Anglers’ Association at Horton in Ribblesdale.” The following are some selected paragraphs that explain how it was set up. The fish house, to which I wish to direct the attention of the Society, was erected by the Manchester Anglers’ Association in 1884 in the romantic dale above Settle through which the upper reaches of the Ribble flow and along which the Settle and Carlisle extension of the Midland Railway has been carried. The fish-house erected by the Association stands in a little glen formed by Horton beck or brook, a tributary of the Ribble, which, like the Aire at Malham and many other water courses of the district, flows from a cave at the foot of a limestone precipice known as Douk Ghyll Scar. The house is thus in a sheltered situation, protected from the strong and cold winds which blow across the hills, or sweep along the dales. It stands on the edge of the brook, which affords a ready drainage, and is a strong wooden structure on a foundation of solid rock. The water supply is obtained from a spring on the side of Penyghent which feeds a cistern, the overflow from which formerly found its way to the brook and is now carried through the tanks in the fish house. A good and permanent supply of unpolluted water is thus obtained, for the spring has never been known, within the memory of the oldest inhabitant, to run dry. The building of the house was entrusted to the village joiner, and it will, therefore, be unnecessary for me to inform any one who is familiar with the still primitive qualities of the district, that it was done in a thoroughly substantial manner. Before the house was erected the water supply was duly tested by Mr Charles Estcourt, the Manchester City Analyst and the present President of the Association, and was pronounced eminently suitable for the purpose. It is conveyed through lead pipes a distance of 65 yards from the cistern, before mentioned, to the house, and as there is a descent of from ten to twelve feet, or say one in sixteen, from the cistern to the hatching tanks, a good pressure is secured. The troughs and trays were made at Bowden under the superintendence of the authorities of the Bollin fish house. The trays are supplied with the usual glass-rod grills, the ova being placed on the rods, and each tray is calculated to hold 1500 trout eggs. As the fish are hatched they escape through the grills into the boxes or tanks. The bottom of the tanks are covered with fine gravel in which the young fish take refuge from the light. Small pieces of slate are mingled with the gravel, and under this the fish find what appears to be often a very welcome shelter. Once the fish reached fry stage they were transferred to a slate cistern that stood in the beck close by. The base of this cistern can still be seen in dry conditions. From the cistern young trout were transferred in a bucket to the river and to Newhouses Tarn and many thousands of trout were stocked into both waters in this way. The eggs or ova that supplied the house came from the surviving stock of Ribble trout and each December members of the Association would net out male and female fish to strip and fertilise the ova prior to placing them on the trays. By 1906 the ambitions of the MAA had grown and the old fish house was deemed too small to provide the number of fish that were needed so it was decided to move to a new site in Jackie Meadow near the head of Brants Ghyll. I will tell you more about this next time. The photograph shows Nat Hunt the MAA keeper watching over his brood of young trout at the hatchery on Horton beck.